The revival of Gamilaroi weaving knowledge is the subject of Amy Hammond’s PhD by Creative Practice, undertaken in the Schools of Law and Arts at UNE. … The woven eel symbolizes the rivers that connect Anaiwan and Gamilaroi country, the eel travels from the coast, up to the tablelands and continue out to the west. Gamilaroi woman Amy Hammond and Anaiwan woman Gabi Briggs wove this eel and lovingly named her ‘Aunty’. Both women wove the eel as part of the ECO Arts Australis, Black Gully Music Festival, held on Anaiwan country in Armidale in 2016. Their project was culturally significant, the weavers wanted to pay respect to the eel, and its importance to stories of both places and represent the ancient connections between their two nations. It is the woven body of an eel that opens up to the mouth of an eel trap. The environmental knowledge, practical skill and cultural practices of weaving have not been as widely used in Gamilaroi and Anaiwan country, since the impact of the British invasion. This disruption to skill, practice and sharing knowledge means that very little is widely known about traditional weaving among these nations. The revival of Gamilaroi weaving knowledge is the subject of Amy’s PhD by Creative Practice, undertaken in the Schools of Law and Arts at UNE. Amy’s research concentrates on the reclamation of weaving knowledge from environmental, linguistic, community and cultural sources, and includes a program of weaving education to revive these skills in the communities of the Gamilaroi and Anaiwan Nations. The eel symbolizes the strength and connection that Gamilaroi and Anaiwan people have always had by incorporating grasses from both countries into the weaving. The eel is woven from a grass called lomandra. Lomandra is an ideal weaving material because of its strength and flexibility. The grass has always grown in Anaiwan and Gamilaroi country, and has been used for weaving in both places for millennia. Amy Hammond says ‘It’s a very special grass and the most amazing weaving material, because it’s so strong and it grows all over country.’ Visitors to the UNE will notice lomandra in abundance, used in landscaping across the campus. The creation of the eel was not just a physical object, but also a significant cultural journey for Amy and Gabi, encompassing important cultural and spiritual aspects. The eel journeys through country, so it was important for the weavers to spend time out on country. One of the most significant aspects of this project was the way that the weavers collected the grasses. In Armidale, Amy and Gabi went out to Blue Hole, with other women, and children. They spent a couple of days there, cutting grasses and preparing them for weaving. This was a process of teaching girls and women how to properly prepare the grasses for weaving, including the environmental and cultural knowledge required to ensure lomandra is cared for and remains a sustainable resource. Amy says ‘The Lomandra is not here only for us to take, where it grows on the river bank and in the water, it’s a home to many’. Equally important was the conversation among the weavers, who wondered how long it had been since women and girls had sat there, talking and weaving. 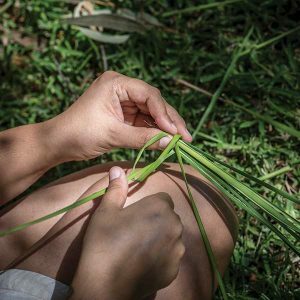 Later, Amy and Gabi did the same thing in Tamworth, to gather the Gamilaroi grasses, talking and listening, learning and teaching, weaving grasses and stories. The woven eel symbolizes the rivers that connect Anaiwan and Gamilaroi country, the eel travels from the coast, up to the tablelands and continue out to the west. The water from Anaiwan country runs through Gamilaroi country and the two Nations have been connected through water, and through story, for a very long time. So the eel flows through that water, and through the stories, and has kept those connections alive.